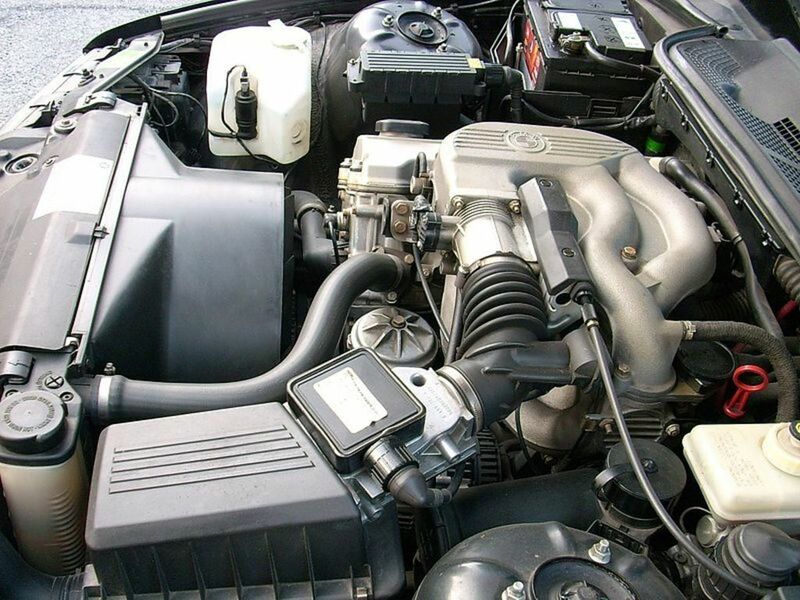 To figure out why your engine won't crank over, you can follow a series of troubleshooting procedures to help you diagnose the problem faster, even if you have little mechanical experience. A no-crank condition usually means the starter system on your vehicle is receiving power—or little power—but a failure in the starter, solenoid, or some other part in the system—perhaps the engine itself—is preventing the crankshaft from turning. The following troubleshooting tasks begin with the most common issues behind a no-crank condition and then goes over other not so common problems. This way, you'll have a better chance of diagnosing and fixing the problem sooner. Note: If you aren't sure you have a cranking problem or suspect another issue with the system, head over to my other article Bad Starter Symptoms: Why Won't My Car Start? The article walks you through a diagnostic based on the symptoms coming from the starting system, and even tells you how to use your headlights as a diagnostic tool as well. So let's start with the electrical system as it relates to the starter system. Failures related to power or the system's electrical circuit, usually manifest themselves—or not—with a clear sign. For example, when trying to start the engine, either you hear nothing or you hear a series of clicks coming form the starter solenoid or relay. The solenoid is the small cylinder mounted on the starter motor, but some vehicles use a remote relay (a small cylinder) instead. Usually, you'll find the remote relay on the fender well near the battery, which connects directly to it. 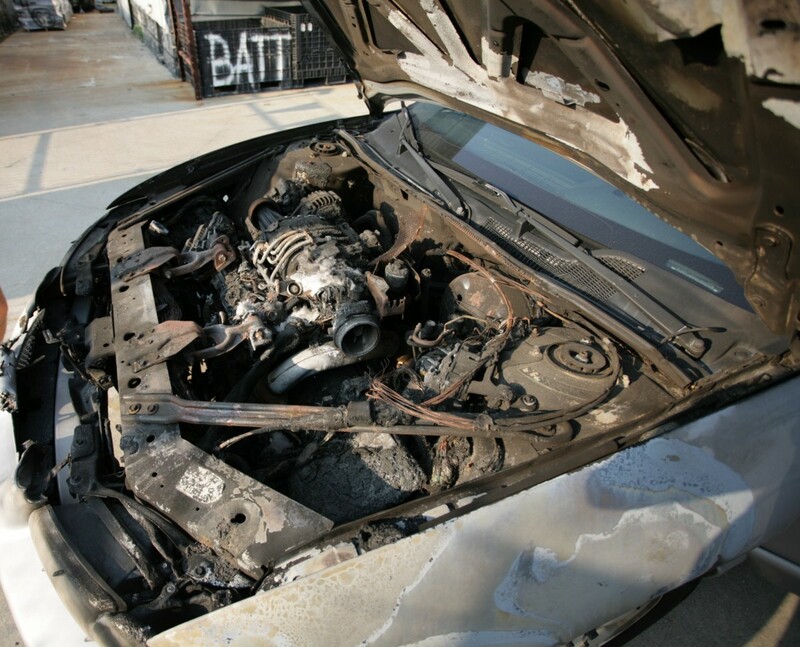 This type of failure usually means you have an undercharged, discharged or failed battery; some wire or connection in the starter system is preventing current from reaching the starter motor; or a component in the system has failed. Use a digital multimeter to determine the general state of charge and condition of the battery quickly. If some power drain left your battery without juice, you car won't start. Turn on the headlights to remove the surface charge and connect the meter across the battery posts. You should have around 12.6 volts. 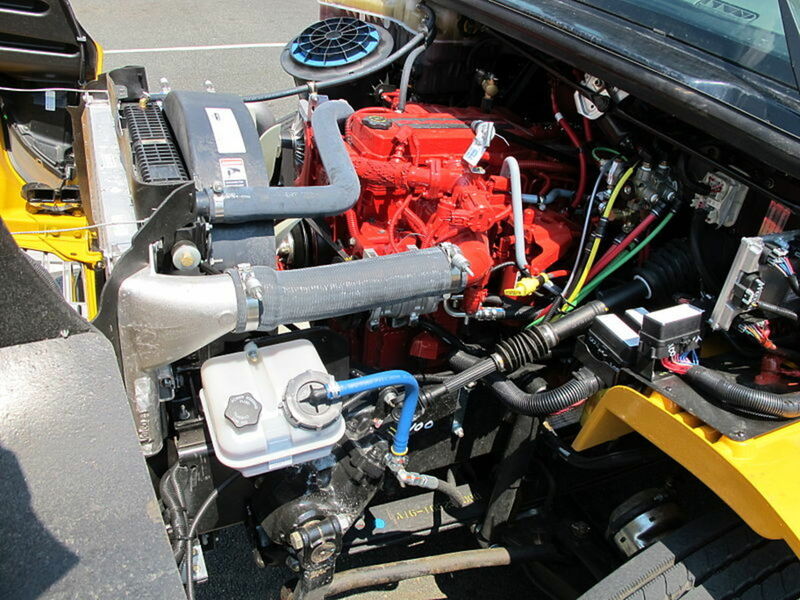 If there's less than 12 volts, you may not have enough power to run the starter motor. Not every one has a digital multimeter on hand, so try jump starting the vehicle. If it starts, run the car for about fifteen minutes to recharge the battery. Check the condition of the battery posts and cable connections. 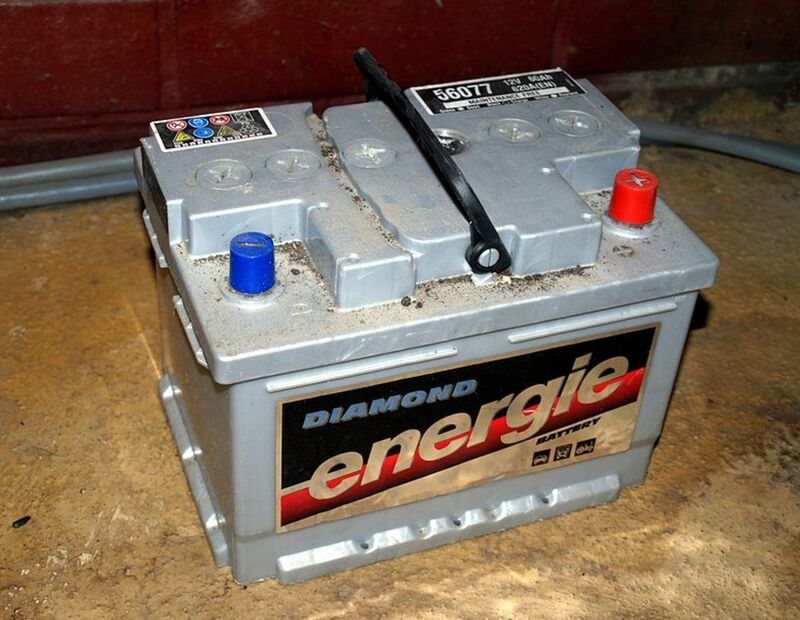 Corrosion buildup will prevent proper current flow from the battery to the battery cables and the starter motor. 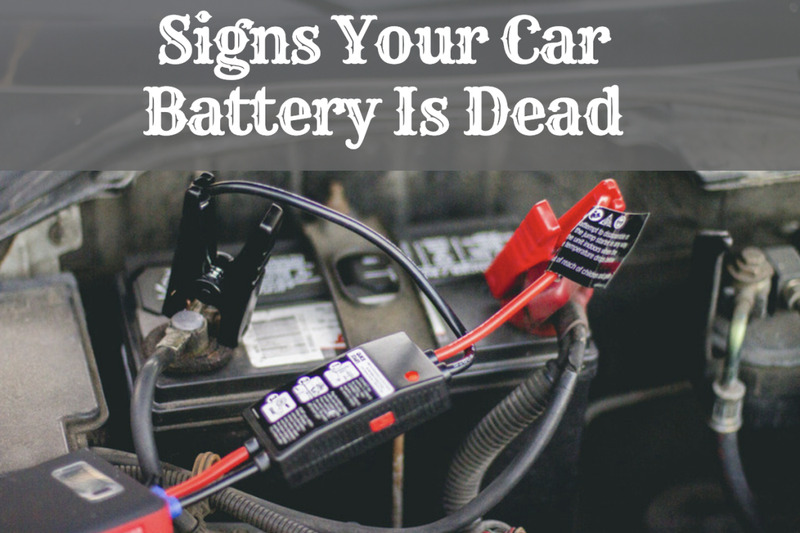 This creates a similar condition as an undercharged or dead battery. If necessary, clean the battery posts and battery terminals using a tablespoon of baking soda and about 8 ounces of warm water. Thoroughly mix the baking soda, disconnect the battery cables and apply the solution with a soft brush. You may also need a battery post cleaning brush to remove corrosion from the battery posts. Check your battery electrolyte level, if your battery has vent caps. Put on chemical resistant gloves, remove the caps with a flat-head screwdriver, and check the electrolyte level (use a flashlight, if necessary). Over time, electrolyte level may go down, preventing the battery from operating properly. The electrolyte should cover the cells completely, or reach the bottom of the fill rings at the bottom of the openings. If necessary, add distilled water to bring the electrolyte back to the proper level. If the previous check didn't turn out anything wrong, check the proper operation of the starter solenoid or relay. See the procedure in this other article How to Check a Starter Solenoid or Remote Relay. A fusible link is a small piece of wire designed to burn when an excess of current goes through to prevent damage to components and the circuit itself. For example, a shorted wire in the starter motor can cause the motor to draw excessive current, which in turn will burn the fusible link, preventing the engine form starting. If the link is burned, find the cause first to prevent the new fusible link from burning again. Locate the fusible link between the battery and the main fuse box. Consult the vehicle service manual for your particular vehicle make and model. Also, you may want to check for problems with either a camshaft or crankshaft sensor, if your vehicle has them. The failing of one of these sensors may prevent your engine from starting or cranking. You can check for sensor failure using a scanner. Along with these sensors, don't forget an alarm system sensor, if you car has this system. If one of these sensors malfunctions, it may prevent you from starting the engine. Even if the Check Engine light didn't come on, scan your computer using a scanner or code reader, depending on your particular vehicle system. If you don't have a scanner, borrow one from your local auto parts store. Your car computer may have stored a trouble code pointing to one of these sensors or another one that may give you a clue as to what went wrong. Also, check all the fuses and relays related to the ignition system as well. Consult your manual for the location of these fuses in your car. Check the condition of the battery cable and wires in the starter system. Look for loose, corroded, or damaged connections and wires. 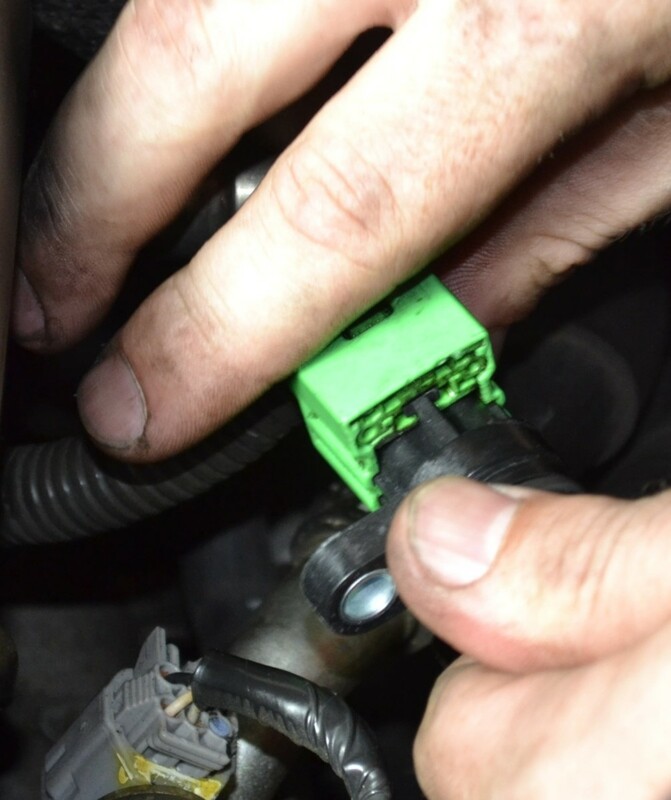 Start with the battery connection at the starter solenoid or relay—depending on the type of solenoid your car uses. Closely inspect the other wire connections on the starter solenoid or relay. Consult your vehicle service manual to locate all the wires in the starting circuit, if necessary. Troubles with the starter motor, starter solenoid or relay can prevent the engine from turning. With this type of failure, as you try to start the engine, you may hear a loud grinding noise, a solid loud click, or a continuous whirring sound as the armature inside the starter motor rotates by itself without engaging the flywheel. Inspect the starter motor mounting bolts. 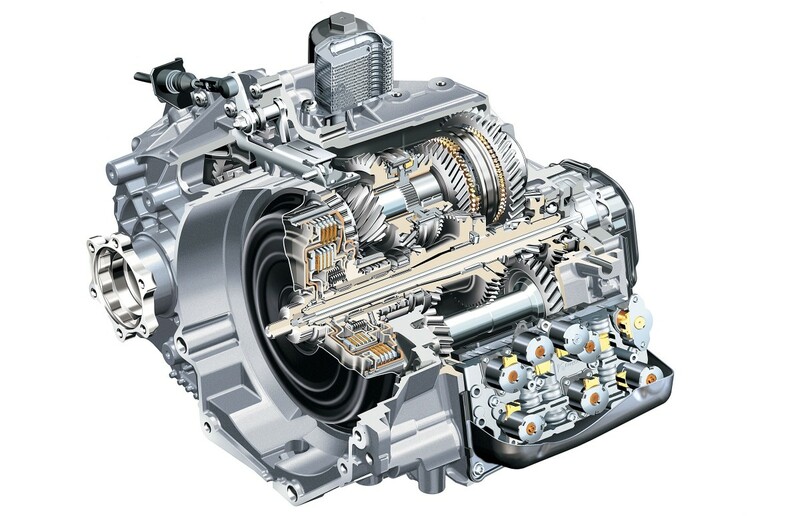 Usually, a loose starter motor will cause a loud screeching sound since the pinion gear and the flywheel gear at the back of the engine will fail to mesh properly, keeping the engine from cranking. You may need to lift the front of your car to reach the starter motor. If you have to, use a floor jack and secure the car with a couple of jack stands. Block the rear wheels and apply the emergency brakes before crawling under the vehicle. 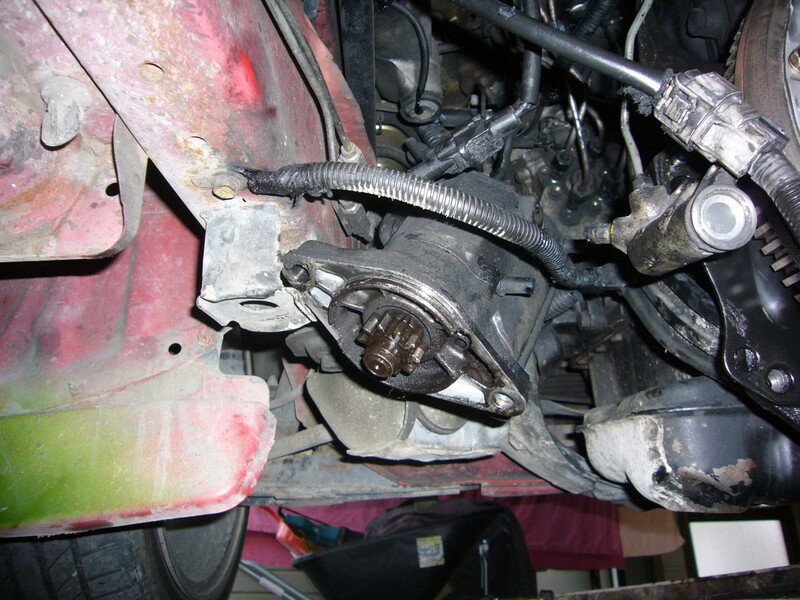 Remove the starter motor from the vehicle to check the starter running clutch. 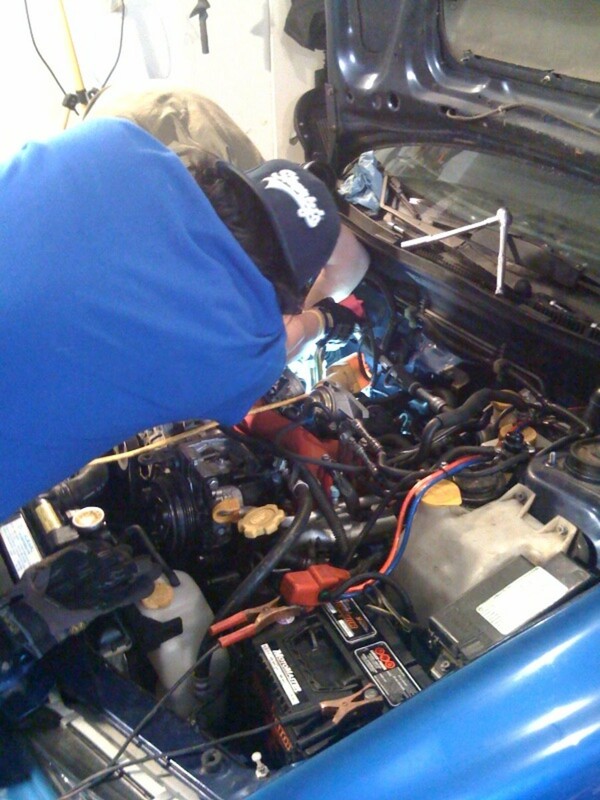 When removing the starter, keep track of any shims located between the starter and the engine. You'll need to replace the shims at the same location for the starter to function properly. Once you have removed the starter from the engine, try rotating the pinion gear (the small gear at the end of the starter motor) in both directions using a flat-head screwdriver. The gear should turn in one direction only. If the gear turns in both directions, replace the starter motor. 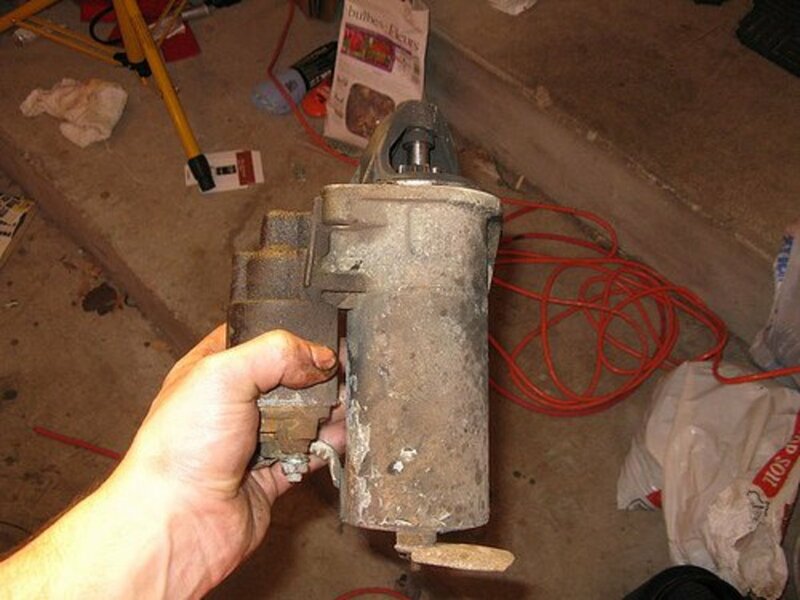 Also, you can take your starter motor to an auto parts store in your area. Many of these stores will test your starter and solenoid at no charge. 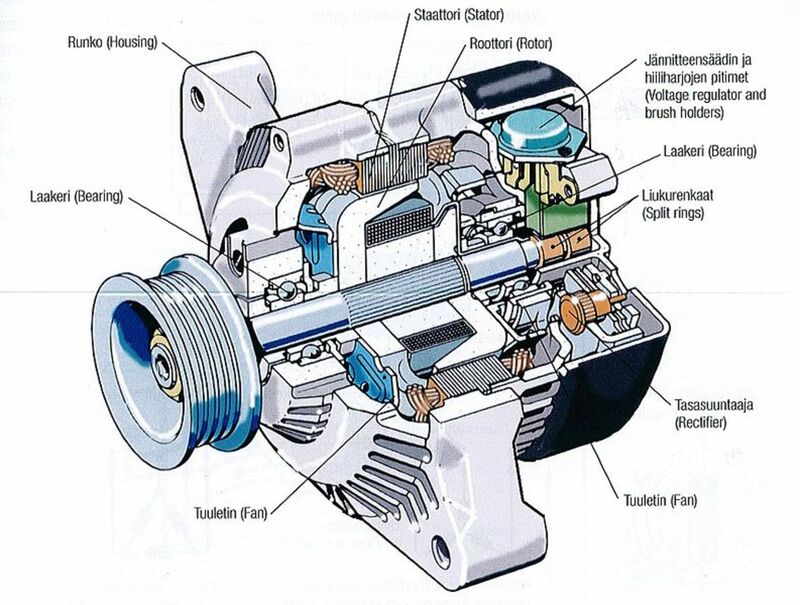 In the previous four sections, you concentrated on the most common problems affecting a starter motor. But a starter may fail to turn or crank your engine because of problems in other areas usually overlooked. We'll look into some of these now. After hundreds of starts, the contacts on the ignition switch can wear out or burn, keeping electric current from reaching the starter motor or some other component in the ignition or starter system. Ignition switch issues sometimes start with intermittent starting problems until you can't no longer fire up the engine. Use your vehicle service manual to follow the instructions on how to check the ignition system in your vehicle. Every make and model have its own ignition system configuration, but your repair manual may point you straight to the device and wires to check. You may need to remove a steering wheel cover and perhaps some other component to access the ignition switch. Your manual will have some photos and diagrams and a step-by-step troubleshooting procedure to check the ignition switch and related components. Also, watch the next video so that you have an idea what is involved in checking an ignition switch. Most vehicles come equipped with a neutral start switch (or a clutch switch) that prevents the starter system from working if the transmission is in gear. This switch wears out over time or moves from its original position, preventing your car from starting. Consult your vehicle service manual to locate the switch in your car and the troubleshooting procedure. Also, mechanical problems can interfere with the starting system. Although harder to diagnose, you still can do some checking. Set your transmission to neutral. Using a large ratchet, wrench or breaker bar, try turning the engine by rotating the bolt at the center of the crankshaft pulley—this is the pulley at the bottom and front of the engine (you may need to remove the spark plugs to make it easier to rotate the engine). If you can't turn the engine or it's too hard to rotate, most likely the engine is seized. Take your vehicle to an automotive shop for inspection and repair. When your engine won't crank, most of the time a quick diagnosis is possible. The procedure outlined here walks you through the most common causes for a no-crank condition and will save you time in getting to the source of the problem, even if you don't have much mechanical experience. What starting system components are likely not causing an engine crank problem? Most common issues come from a faulty battery, relay-solenoid and starter motor. Sometimes a bad wire (loose or corrosion); less common, the ignition system. Can you describe some of the most likely faults that would cause an engine not to crank over? Check the section “Problems That May Cause a No-Crank Condition” in the post. Which direction should the engine rotate if you use a wrench to turn it?